I have worked with Fragrance Direct on a couple of occasions, you can see my posts about their products here, here and here. I have purchased products with my own money, as well as being sent products for review. I'm really happy with their range of products, the fantastic prices, and their brilliant customer service so wanted to collaborate with them for this giveaway, and introduce you to this company. Congratulation on 1000 followers! Great achievement! Congrats on 1000 followers! 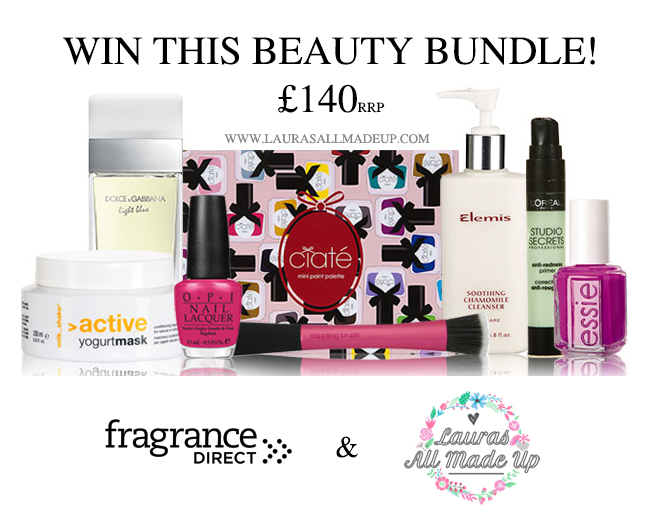 You've picked some fab items for the giveaway! Wow this giveaway is amazing!! Congrats! Ooh by the way, I've tagged you in my '5 product face' tag and would love to see what you'd chose! Well Done, love the giveaway. This is a dream, Laura! 1000 followers! Congratulations! Here's to many more! Best wishes and Kind Regards Laura! Congratulations on 1000 followers! Congrats on 1000 followers. Amazing giveaway. argh!! did a typo on my bloglovin username! whoopsie!